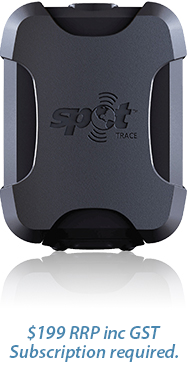 The SPOT Trace is a compact, low cost asset tracking and motion alert device, powered by 100% satellite technology on Tracertrak. The tiny, lightweight device is simple to install and when used with Tracertrak it gives full visibility of asset location as well as alerting the user to any unauthorised movement. The SPOT Trace on Tracertrak provides near-real-time location information on anything from vehicles and trailers to plant and machinery, meaning your organisation spends less time searching for assets on remote sites and more time utilising your valuable resources. Includes unlimited tracking at 5, 10, 30 or 60 minute intervals. Includes unlimited tracking at 2.5 minute intervals. Pivotel Satellite Pty Limited. Prices are in AU$ and include GST. Each SMS recipient for an alert will be charged at the SMS rate. 2-way SMS Responses, SMS Reminders and SMS Acknowledgements sent to each recipient will be charged at the SMS rate. A compatible SPOT Trace device is required to access the Tracertrak SPOT Trace service. Pivotel may apply call barring where fraudulent use is suspected or for credit control purposes. You will receive a bill by email from Pivotel listing any payments you have made during the billing period, and a summary of your service usage to enable you to keep track of your overall service usage and monthly spend. An itemised bill listing all of your service usage events is available on request. You may elect to receive a paper bill by post for an additional fee. Tracertrak plans are available to credit approved customers only. Minimum contract term is 12 months. Minimum cost for SPOT Trace Services is $444 on Trak SPOT Trace Unlimited and $600 on Trak SPOT Trace Extreme over 12 months plus cost of SPOT device. Choose a device profile based on your desired tracking frequency. This waterproof SPOT Trace DC power cable is 3m in length, with an IP67 rating. It has an input voltage range of 8V to 22VDC* (input fuse 2A).